The GOP has just eight days to pass legislation to repeal ACA, and the Cassidy-Graham bill is perhaps the most drastic effort we’ve seen to date. Cassidy Graham would upend the health insurance and healthcare industries almost overnight. The ACA would end on January 1, 2020. Over ten years, states would lose a total of $215 billion in funding for healthcare. 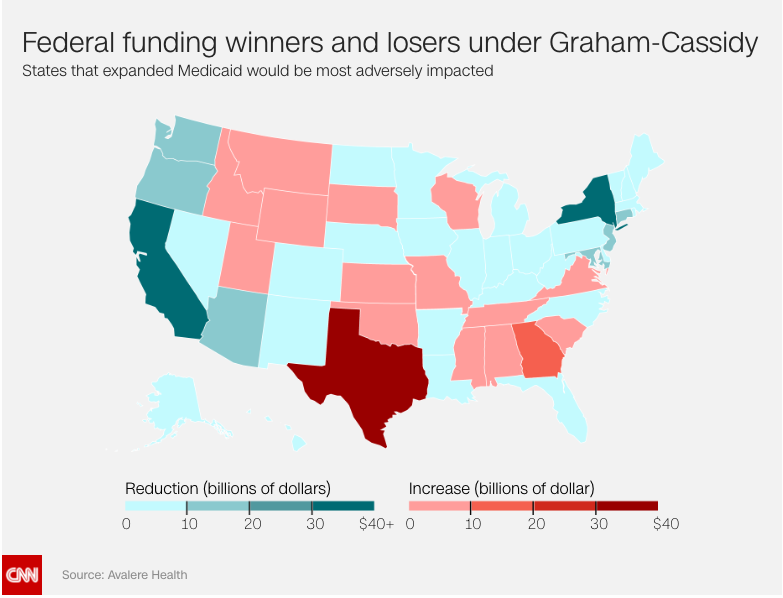 The federal subsidies that now go to the 31 states that expanded Medicaid would be spread across all 51, making Texas, Florida, Alabama and other non-expansion states big winners. New York, California, Pennsylvania and other expansion states would lose billions. States that wanted to replace ACA would apply for federal block grants; each would come up with their own programs and approach. Insurers would still be required to cover any and all applicants. It’s likely at least 15 million, and probably more than 20 million, would lose coverage. The individual insurance markets would be in turmoil starting October 1. Insurers would exit the individual markets as none would want to be the last option for folks desperate for insurance. Many states would be unable to come up with their own solutions in that timeframe. Smaller states such as Delaware, Montana, Rhode Island and the Dakotas would be hard-pressed to develop and implement a program in 27 months. The Medicaid programs in big states would be severely disrupted, with potentially devastating consequences for hospitals especially those in low-income areas. If Republicans marshal the votes necessary to pass Cassidy-Graham, they will blow up the health care industry, with devastating and far-reaching consequences. Scott – welcome to MCM. I’ve posted here numerous times on how to fix ACA; I suggest you peruse other posts to get details. I’ve also posted on ACA’s problems, which are in no small part due to Sen Rubio and other Republicans’ efforts to make it fail. Finally, there have been many efforts by Democrats in Washington and elsewhere to advance fixes to ACA – to date all have been stymied by ACA opponents. Thank you for your response to the above, Joe. I admire you greatly. Republicans in Congress do not like to deal with healthcare so they want to burden state legislators, mostly Republicans, to deal with it. They are even less able to deal with it so they will hand it over to state house lobbyists from the hospital, medical society and drug industry.